It’s about time crayon like children scribbles made it into the tattoo world thanks to artist Yann Travaille at YourMeatISMine.com! Very simple, fun, and clean. His work reminds me a bit of our good friend Sam at ExplodingDog.com. The world was shaken to the tragic news of Michael Jacksons passing this weekend. As weeks progress and the world seeks into his incredible mysterious life many new things will be learned. One element that has surfaced is his contribution not only to music and dance, but in inventing! I hope someone makes these shoes available for all to rock out on! Michael, you are a global legend who made massive changes to our society and an icon in history never to be forgotten … Rest in Peace. I’ve seen clouds, real clouds, and web clouds, but I’ve never see cardboard clouds, created by Fantastic Norway, which give a pixelated environment of brown clouds which looks pretty awesome in a huge warehouse space. If you have a huge space to do something, go make cardboard clouds! Reminds me a bit of the styrofoam robots! More pics after he jump! 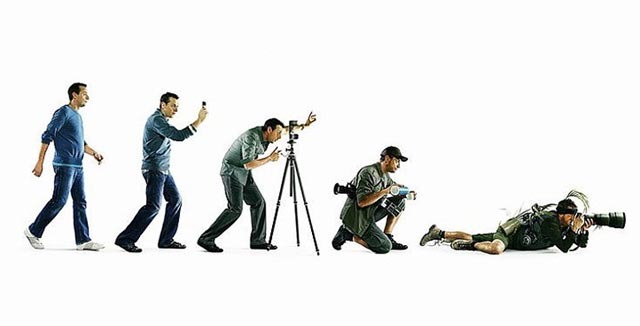 I’m still digging the “Evolution of a Career in Advertising” image, but my favorite still goes to Daniel Pinks “Evolution of Man” which evolves a business man into a creator, artist, designer perhaps =) . Watch his great lecture on Poptech here. The other two evolution pics after the jump along with Dans video. John Hodgman Roast: Barack Obama First Nerd President! Awesome roast! Watch Hodgman’s speech above, and Obama’s after the jump. I think I’m going to require any cool space to have Super Sized Stuffed Animal Dolls by Florentijn Hofman from now on, which is on exhibit at Galerie West in The Hague (The Netherlands). Whenever I see a large room with space to fill, I’m going to think it needs a super sized stuffed animal to jump onto. I went to some open studios last week in Boston and met Susan Jane Belton who some years ago was bored, and started painting what happened to be in her studio space, which just so happen to be a pile of to go coffee cups sitting in a corner. Ever since she’s been collecting, bagging, and painting her daily cups of coffee… not all, but the ones the intrigue her. I wish I took a picture of her wall of plastic bags full of coffee cups. Nice simple collection! A convenient wall of outlet plugs. I’d prefer an inductive wall with magnetic plugs! Anyhow, this beats finding the darn outlet each time hidden beind everything… though I’d fear a flare up. First the Fail Whale shirts, and now the “Anonymous User” shirts! Ya gotta love the twitter fans! Stop-Motion Fun with Post It Notes! “Paul just sent over this video of a dance tribe forming spontaneously at a music festival. My favorite part happens just before the first minute mark. That’s when guy #3 joins the group. Before him, it was just a crazy dancing guy and then maybe one other crazy guy. But it’s guy #3 who made it a movement. Initiators are rare indeed, but it’s scary to be the leader. Guy #3 is rare too, but it’s a lot less scary and just as important. Guy #49 is irrelevant. No bravery points for being part of the mob. Woa, Pygmy Jerboa’s are like little cartoon kangaroos witha face of a mouse. I can’t remember the last time I saw a little creature like this and said give me a thousand! How cute… Watch the video above!